Do you know any bookworms that would love some new reads this holiday season? Books make a great gift for those members of the family who need a break from all the electronics in the house. We all need to unplug every once in a while, don't we? Even if there aren’t kids in your own house, I’m sure you know some young people who would enjoy these books. Maybe you are a youth leader or teacher with young people on your Christmas list. New Growth Press is jumping into the gift giving season by giving away THREE children’s book gift boxes (retail value of $125 each). All of their children’s books are beautifully illustrated, entertaining, teach a lesson, and most importantly, are biblically based! 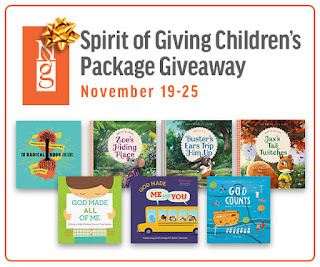 From November 19-25, you can enter to win one of three children’s gift boxes. This playful children’s book serves as a beginner’s theology book for young readers who love numbers and patterns. By discovering numbers in God’s world and in his Word, parents help their children foster a deeper love and knowledge of who God is and how he counts them as his. With countable illustrations and an easy-to-learn structure, children who are always seeking, finding, tracing, and counting numbers will be captivated by God Counts. These three books are a part of the Good News for Little Hearts series. This is a new series of hardback, illustrated children’s books for three-to eight-year-olds—each centered on an animal family. The animal characters, colorful illustrations, and the real-life issues each animal family face will captivate children. The first three books address anxiety, anger, and failure, bringing biblical counsel and hope to issues every child faces. Together children and parents will be guided by the stories into meaningful conversations about living by faith in everyday life. God Made Me and You invites kids to explore God’s design for ethnic diversity. Because Scripture teaches that ethnic diversity is not something that should be tolerated but rather enthusiastically embraced, Christian hip hop artist Shai Linne helps children, parents, and caregivers to celebrate this biblical truth through a lyrical, rhyming style and colorful illustrations. God Made All of Me is an invaluable resource and beautifully illustrated story to help families talk about sensitive issues with two- to eight-year-old children. This helpful guide starts from the fundamental truth that God created everything and applies that truth to kids and their bodies. With the help of God Made All of Me, parents and caregivers can begin conversations with boys and girls about their bodies, navigating a discussion that can so easily be warped into confusion, embarrassment, and secrecy. The Radical Book for Kids is a fun-filled explorer’s guide to the Bible, church history, and life for boys and girls ages eight and up. Vibrantly illustrated and chock-full of fun facts and ideas, this interactive book competes with screen time by stimulating children’s natural curiosity and sense of adventure! Along with the many fun and exciting stories of historical figures, young and old readers alike will learn about the roots of our faith and the importance of the gospel in our lives. In case you don’t win the prize pack, sign-up for New Growth Press’ e-news at https://newgrowthpress.com/ to receive information about their Countdown to Christmas discounts so that you can order copies. (facebook.com/ngpbooks | twitter.com/newgrowthpress | instagram.com/newgrowthpress). The Attic Girl received no compensation for sharing this giveaway and it not responsible for prizing.